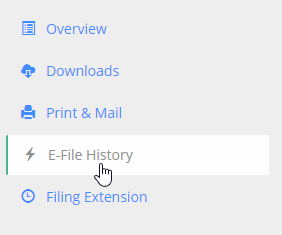 How do I check on the status of an e-file request? We will automatically send you email updates as your filing is processed, but you can also login to your BoomTax account and view your e-file status under 'Status' on the 'Filings' screen. Then, click on the name of your filing. Next, look for the 'E-File History' panel to see the date the filing was submitted, how many forms were sent, along with the IRS/SSA issued receipt id and the filing status.